Meet for breakfast with the DCNTP Chair, Heather Lott, and other program leaders to talk about continual development of a high quality induction program within your district. Agendas include assessing programs using NTC’s Induction Program Standards, cross-district sharing of resources, and supportive, collegial coaching. For more information and to RSVP, contact Heather Lott. DCNTP’s District Council is really the heart of your consortium membership. Lead mentors and school leaders come together to gain insight into their own programs, and to share knowledge and resources with similar-size districts. We meet four times a year, from 2:00-4:00 pm at the Monona Grove School District Office, 5301 Monona Drive, with snacks and beverages provided. Bring up to five members of your induction team for a day away to plan 2018-19 support for new teachers and mentors. The one-day District Induction Team Retreat will be on May 23 from 8:00 am to 3:00 pm at the Monona Grove School District Office. DCNTP offers seminars, forums, and breakfasts to mentors, principals, instructional coaches, and beginning teachers, plus guided work days for your induction team, that are included with your consortium membership. Workshops from NTC for your induction staff are offered through DCNTP at reduced rates. 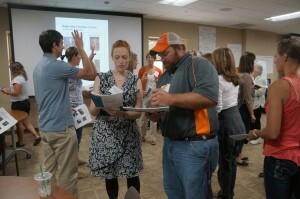 Each year we offer scholarships for the New Teacher Center Symposium held in February.